National Bakery School student Zara Snell has beaten the best in the business to win the Great British Spiced Chocolate Challenge culinary competition at the Salon du Chocolat Chocolate Show – the annual celebration of all-things-cocoa related. 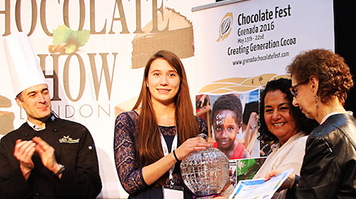 The talented 19-year-old from Hampshire scooped the top prize by wowing the judges with her decadent Moroccan Rose chocolate creation earning her trip to the 'spice island' of Grenada for next year's chocolate festival. Zara’s winning creation has been fast-tracked to go on sale at the world renowned Food Hall in Selfridges, just in time for the festive season. The challenge entailed both amateur and professional chocolatiers competing to create a new and unique chocolate. The aim of the competition was to create a spiced chocolate from a choice of more than 200 spices. Zara created an exotic fresh cream ganache flavoured with rose and infused with a selection of spices, coated in a crisp dark chocolate shell. “I am really looking forward to heading off to Grenada for the Chocolate Festival – I’ve found it really inspirational to work with the spices for this year’s competition and can’t wait to try them out over there and meet the farmers themselves,” said Zara. The competition judges, which included Joanna Simon, wine and food editor at House & Garden and chocolatier Paul A. Young, thought Zara’s confectionary was “absolutely delicious”.